I had truly wanted pastel frames for quite some time, and I think I even dedicated a few Pinterest images to this desire. So, with great enthusiasm, I got really excited when I heard that these eyeglasses were waiting for me in a parcel. Thankfully, I finally received them safely, and went journeying on in route to meet up with a colleague. I could not wait to try them on to get the full effect, surely fellow eyeglasses wearers would understand. Just as any fashion garment or accessory these particular eyeglasses are certainly not for a self-doubting, conservative, or shy type of fashionista. Although, I will tell you a secret … I used to be painfully shy in my youth, believe or not! But, when it comes to fashion … not at all. I always enjoy artsy statement pieces of expression. Yes, I would say that now, I have a proper eyeglasses collection—everything from classic cat eyes to tortoise style frames are included. One for any type of outfit or day of the week, it’s no problem! But, these are more of a playful fashion statement. Ah, the glory! Can you feel my excitement? I tried to capture these frames with an easy outfit, but even in the photos they looked a wee bit different than they actually do in the sunlight vs. indoor lighting. Up close and personal though, they are more of a light lavender colour, and it works well with neutrals. Anyway, I am very happy with these frames and have been wearing them so far most of the week. Will I be acquiring pastel shoes with a matching pastel bag to wear along with these frames? Hmm, not a chance! But, if you somewhat know my style at all, then you already knew that. Perhaps, I will style them differently (think, something printed and vibrant) with another outfit very soon. Have you tried a new style of sunglasses or eyeglasses recently? The goods: Derek Cardigan matte frames Style#7003-c/o Coastal. View new frame options here. Denim mini skirt-Refuge/SF-thrifted, Tank, Cardigan-Express, handbag-Vintage. *Special thanks to my friend Dahlia for dyeing my hair with a few streaks of blue. *I am also linking this post up with Sacramento's Share-in-Style "Denim" series. View more here. I like these frame a lot, I have a crush on pastels!! They look great on you! The frames are gorgeous! I can definitely see these as the perfect glasses for a fun, pastel filled bright day! I hope you get to wear them a lot! I've never seen this colour on sunnies before, Madison. I like it a lot! I do think it would go with almost anything. It's such a great feeling to finally get an item you've been wanting for awhile. There's something so fun and happy about pastel frames. I'm currently coveting a pink pair :) You made a lovely choice and they look great on you Madison! Ich freue mich mit dir. Ich weiß, wie dass ist wenn man länger auf was wartet. Die farbige Brille ist klasse. Ich mag farbige Brillen sehr gerne, die peppen jedes Outfit auf. I used to be shy, too! Are your glasses prescription? I've had to wear glasses since the 4th grade and though they used to be uncool, I've grown to love them and have built a nice collection up myself. They're truly a fabulous accessory! Thanks so much Lilli. I'm so happy with them. :) happy weekend. Yes, I wear prescription glasses. I started wearing frames around about my teens, maybe 13/14 age period, but of course, now frame styles are sooo much better today! :) Thanks Stephanie! Exactly, sometimes all you need is a good waiting period ... I've seen pink frames, so I'm sure you will find a great pair soon. I actually have a cateye (light pink) frame that I bought from Coastal a year ago --> http://j.mp/1objygB Thanks Rowena. Danke Cla, Haha! :-) Ich liebe diese Farbe, und ja ich stimme Brillen, ideal für Outfits! Actually I've really been trying out new shapes & colors of sunnies for Summer & I'm loving those mirrored ones.....they're so much fun!!! These frames really suit you. 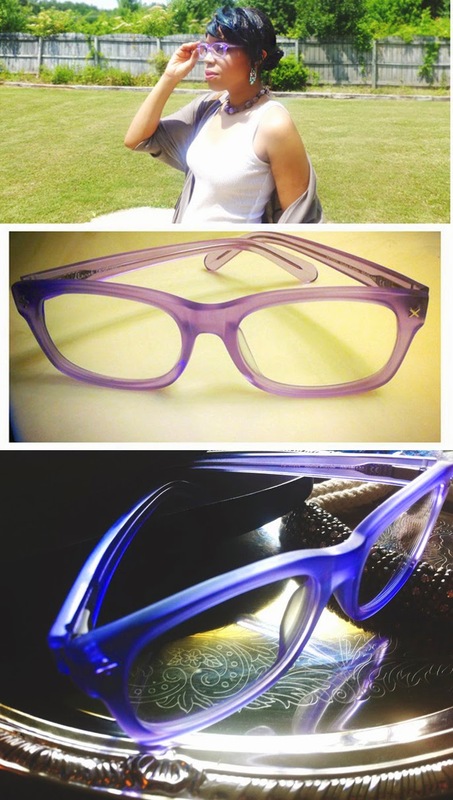 The lavender shade is such a summery colour and so different from all the dark heavy frames which are being worn at the moment. The right choice of glasses can make such a difference. Have a great weekend! I am in LOVE with those frames! They seriously brighten up your entire face / outfit. Gorgeous!! LOLZ....I don't know why I wrote "sunnies":D Brain fart! What a cute look today, the glasses are fun and suit you! The last pair of sunglasses I got was in November. Your glasses look great; definitely suit you! What a pretty color! These are really lovely and fun frames!!! Lovely look, dear! Have a nica day! Thanks miss b. Yeah, I'm very happy with the pastel colour. They're so different than my usual dark cat eye frames. :) Enjoy your week. I also used to be painfully shy as a kid. I'm better at it now, though. I don't wear glasses, but I kind of want a pair (non sunglasses). They just look so cute on everyone. Liebe Rena, danke, dass Sie meine Brille lieben. Haha, ja, es kann auf den ersten überwältigend sein. Ich liebe es, verschiedene Stile mit meinen Outfits zu wählen. Ich hoffe, Sie haben eine schöne Woche.